Gain a wealth of information, inspiration, and know-how on moving your artistic career forward from one of the most successful illustration agents in the industry! I Just Like to Make Things is a dazzling, colorful volume of career and personal advice for artists, filled with ideas, playsheets (as opposed to worksheets), case studies, and tools for staying inspired and creative. These pages are grounded in the wisdom and experience gleaned from a long and buzzing career as creative juggernaut Lilla Rogers shares her analysis of leveraging various working styles and ways to keep your art fresh. Artist interviews provide inside details about the best jobs, as well as tips on how to work smart and stay creative. You’ll also find annotated case studies of several successful art jobs, in addition to coloring book pages, hand-drawn charts, and lots of crazy fun. 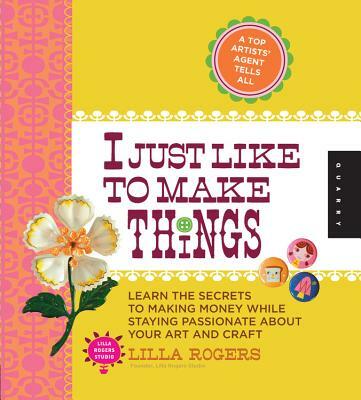 Acquire real-life, professional advice from an artist known for setting the trend with I Just Like to Make Things! Lilla Rogers was a full-time, highly successful illustrator beginning in 1984 with clients ranging from the New York Times, Takishamaya, Barneys New York, and Levi’s. She had agents in Tokyo, Paris, and New York. In 1994 her top students asked her to represent them. Since that time, Lilla Rogers Studio has become one of the most respected illustration agencies in the US, with clients in Europe and Asia and known for setting trend. Being an illustrator and teacher allows Lilla the unique position of helping her artists grow as she fully understands the creative process and how to nurture the best in each artist. She has lectured internationally at conferences and trade shows, such as the Illustration Conference (ICON) and PrintsourceNewYork, colleges and corporations, and is interviewed for her expertise as an agent, trendsetter, and artist. She lives in Arlington, MA. Visit her online at http://www.lillarogers.com.